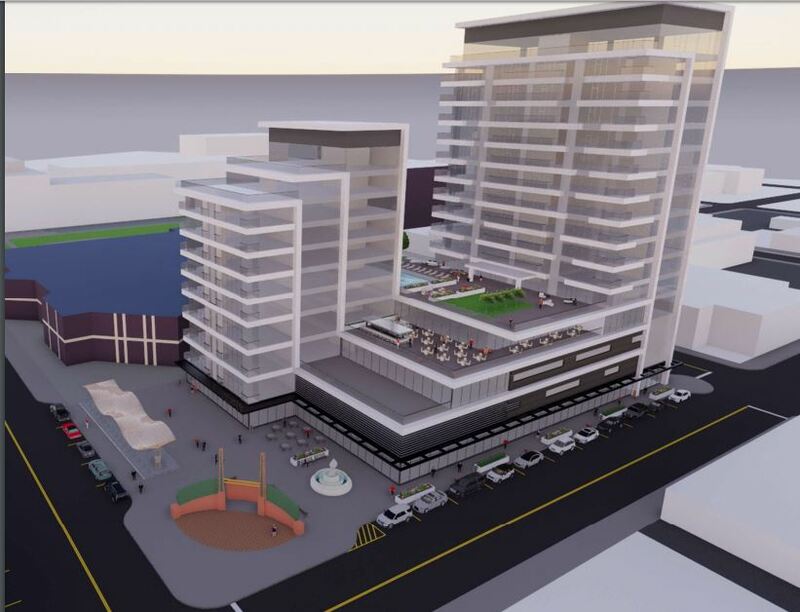 A new proposal for the parking lot by the Baylake Building. The Phase I (west) building is 11 stories above ground, comprised of retail, office, and recreational space, as well as approximately 50 apartments including studio, one- and two-bedroom options. Retail space on the first floor is intended for occupation by small shops such as bakery, coffee/sandwich, dry cleaners, hairdressers, souvenir shop, and other vendors. A designated common space will offer free high-speed internet. A small fitness center may be included. Second and third floors will include parking space and a few offices for rent. A fourth-floor restaurant will include outdoor patio space. A swimming pool area for residents is being considered. This building also includes three open rooftop spaces for up to 8 residential units and the 11th floor may have a rooftop gathering space for all residential tenants. The Phase II (east) building starts at the fifth floor and raises to 16 floors above ground. Floors five through 13 will include up to 64 one- and two- bedroom condominiums; and the top three floors will include 12 executive condominiums and 4 penthouse suites. Approximately half of the condominiums have outdoor access with decks. I would bet cash money that this is another part of the U.N.'s Agenda 21. Oh, that and another attempt to get people riding bikes. (09-08-2018, 12:36 PM)k.d. Wrote: I would bet cash money that this is another part of the U.N.'s Agenda 21. Oh, that and another attempt to get people riding bikes. I can give you two examples of Agenda 21 being forced on citizens of Green Bay. I did weeks and weeks of research on these at the time. 1.) That every home in Green Bay have a sump pump. 2.) That trail along the river which deprived people of their property for the Marxist 'greater good'. (09-08-2018, 01:42 PM)k.d. Wrote: I can give you two examples of Agenda 21 being forced on citizens of Green Bay. I did weeks and weeks of research on these at the time. 1.) That every home in Green Bay have a sump pump. 2.) That trail along the river which deprived people of their property for the Marxist 'greater good'. It is the government at the direction of the UN using force against you. Another example: I have always owned my own cars free & clear, but now I am forced to have insurance under threat of government force. What about Obamacare? Forced to have health insurance. I'm sure that places you have worked face the same thing regarding forced regulations. But back to Agenda 21, that is what caused the disappearance of downtown as we used to know it. (09-08-2018, 03:07 PM)k.d. Wrote: But back to Agenda 21, that is what caused the disappearance of downtown as we used to know it. I will cede that point if you consider the mall the demise of the previously quaint old downtown. Current time: 04-22-2019, 08:03 AM Powered By MyBB, © 2002-2019 MyBB Group.